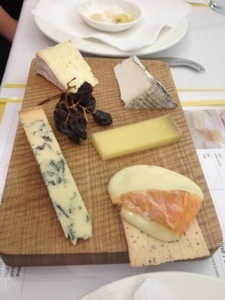 Dreams came true when I won a Cellar Door Wine Festival Adelaide twitter competition back in February and I became the lucky holder of a voucher for two to attend a cheese Master Class with Adelaide’s The Smelly Cheese Shop. Imagine my delight! Two hours with some award-winning cheese and wines to match (there is a wide range of Cheese Master Classes available, but who can say no to wine and cheese?!). The cheese consumption didn’t come as fast as I would’ve liked, but it was oh so worth it. Our cheesemaker Valerie Henbest, a lovely lady with an interesting French accent, took us on a journey through the cheesemaking process, including jamming 30+ people into a cheese ageing room that strongly smelt! 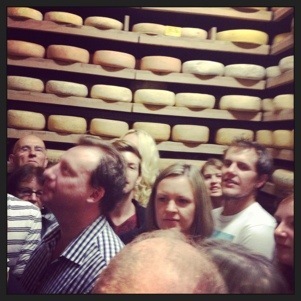 Like clowns in a clown car, we piled in to learn about the cheese we were dying to taste. Next it was back to the tasting room where we tested our tastebuds out on salt, lemon, cocoa and sugar. This taught us to learn where we taste and to actually stop and taste. THEN the cheese part happened! I can’t say cheese has ever sat in front of me for so long and remained untouched, but I can say I’m glad I resisted because Valerie and the man with the wine, James Erskine, took us on a journey. We learnt about the cheese, its historical origins, what the tastes were within the cheese and then we tried it with the wine. I was amazed at the tastes, I was shocked at times and at other times I stole cheese from my fellow Master Class attendee! The Smelly Cheese Shop tasting selection, clockwise from top right, Valencay or soft (ripened goats cheese), Beaufort D’Alpage (similar to gruyere), Affidelice ( there are no words to describe how fabulous this one is, Colston Bassett Stilton (blue vein cheese) and Camembert. If you have the love for cheese and want to know more, I’d highly recommend The Smelly Cheese Shop and its Master Classes. 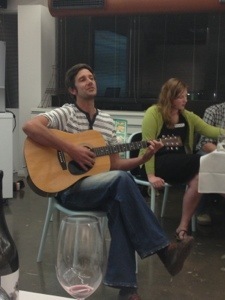 Although, I can’t promise the winemaker will serenade your group like he did us! This entry was posted in Blog, Sponsored Post and tagged Adelaide, Adelaide Central Market, Cellar Door Festival, cheese, The Smelly Cheese Shop, wine. Bookmark the permalink.